According to tradition, the Garden of Eden was a place where no evil existed. No pain, no suffering, no death. Perhaps it's that same “Paradise” Moslems are taught is worth dying for to achieve. They might want to reconsider their desire. The tale of “The Fall” belies the absence of evil there, for how else could two proto-humans discover (through the Tree of knowledge of good and evil) evil, if it wasn't present from the beginning? This story tells of a creator-god who, following creation, pronounces his entire creation “good.” It follows the Tree of Knowlege was good, and therefore, its fruits. The creator's calling attention to the tree in the most obvious way, made investigating the fruit all the more desirable. After all, some of the most unalienable rights we humans possess are curiosity and questioning. And considering those humans involved had neither knowledge nor experience of what “death” meant, we can understand their curiosity to find what it's all about. The story tells children and adults not to let their curious and questioning natures stand in the way of obeying arbitrary “do not's.” The lesson is: if you do, you will be punished. And yet, without exercising those attributes, without following our doubts and testing claims, we can't make progress. Since the woman makes the first move, we might in all fairness credit our freedom to her. Metaphorically speaking, we are the serpent who tempts ourselves to challenge, find out for ourselves, to explore, to take no man's nor god's word for what is of interest and/or importance to us. And, though fears are normal, knowledge is our way out of fears. We must listen to the serpent, decide for ourselves. Banishment of questioners is an indication the figure who demands they not question is threatened by their freedom to question. Might the creator-figure be jealous of them, since he hasn't the free will they have? And if arbitrary and unfair banishment is the result of our challenging the tale's authority figure, it has proven to be well worth it. We have been true to our nature. 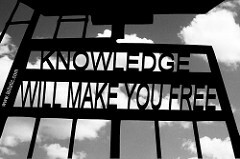 We proved we can choose knowledge over the security of complacent ignorance. According to the Garden of Eden tale, humans were cast out into a world they were completely unprepared for. For this, they needed to take along their tempting inner serpent, and as many of the forbidden fruits of the Tree as they could. Thus, the seeds continue to produce more trees, more knowledge, ever after. And, so it is, we are ever after learning from its fruits. Our curious, questioning, investigating and inventive natures lead us to conclude that a human, another inventive human like ourselves, made up the whole god/creator/creation/paradise/expulsion story, because no one could have witnessed such things. Someone should have burned the story. A true original sin would be in choosing the blind obedience to ignorance, instead of knowledge. The Tree and serpent have set us free.